Our folk music is of great beauty and variety. Some of its themes were used by famous European composers, like Bedrich Smetana and Joseph Haydn, who spoke Croatian. Joseph Haydn (1738-1803) was born in a Croatian ethnic enclave in Burgenland (Gradisce) in Austria. For example the main theme of his London symphony no 104 in D major (movement IV) is based on the well known Croatian traditional song "Oj, Jelena, Jelena, jabuka zelena" (Oj, Jelena, Jelena, my green apple). Also the final of his Es major symphony is based on the Croatian folk song "Divojcica potok gazi" (A little girl treads on a brook). And even the following song that is widely known in Croatia - "Nikaj na svetu lepsega ni, nego gorica kad nam rodi..." (There is nothing more beautiful in the world than a fruitful hill) was exploited by Haydn (I learned this on a wonderful 11th birthday party of my dear friend Ema Tolic). Author: Hadow, William Henry, Sir, 1859-1937. Title: A Croatian composer; notes toward the study of Joseph Haydn. Description: 98 p. illus. 22 cm. Notes: Reprint of the 1897 ed. A distinguishing trait of Haydn's works was his frequent use of Croatian folk music for his melodic material. Wrote W. H. Hadow: "The Croatian melodies are bright, sensitive, piquant, but they seldom rise to any high level of dignity or earnestness. They belong to a temper which is marked rather by feeling and imagination than by any sustained breadth of thought, and hence, while they enrich their own field of art with great beauty, there are certain frontiers which they rarely cross, and from which, if crossed, they soon return." 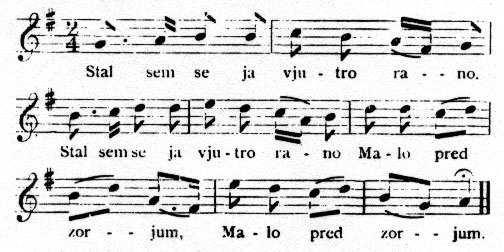 Even many of Haydn's original melodies are characterized by typical rhythmic and melodic qualities to be found in the Croatian folk songs. However, as Franze Bellinger has added, "Haydn's speech, like that of every genius, was not only that of his race, but of the world." To these Croatian characteristics, Haydn added his high inspiration and sensitivity, and produced a type of melody which, for the most part, is unmistakably his. Haydn is a common Croatian family name. In the Croatian telephone book you can see the names of Hajdin, Hajdina, Hajdinjak, Hajdinac, Hajdinovic: 63 families in the Zagreb county, 91 families in Medimurje and Varazdin counties, 65 families in Primorsko-Goranska county; and altogether 320 families in the whole Croatia (1999). There is a village of Hajdine near Vrbovsko in Croatia, on the main road to Rijeka, and the village of Hajdin near Vojnic. The name Hajdin (= hajda's) is derived from hajda = buckwheat. "It is a pity that in his time Kuhac did not know for team work, or could not (was not allowed to?) accomplish. Otherwise - the redactor [ie. Zupanovic] is firmly convinced on the basis of own experience - ... that for half of names listed [by Kuhac] in his Hystorical introduction he would have no problems in proving their Croatian descent. This especially holds for Franz Joseph Haydn..." (see [Kuhac, p. 305]). "Šteta je što Kuhač u svoje vrijeme nije znao za timski (grupni) rad, ili ga - ako mu je i bila poznata tehnika - nije umio/moga (smio?) ostvariti. Da mu je to uspjelo, on bi - priređivač je na osnovi vlastitog iskustva u to čvrsto uvjeren - zajedno s po jednim lingvistom, povjesničarom, arheologom, teologom i još pokojim (strukovno srodnim) znanstvenikom za polovicu imena što ih je naveo u Historijskom uvodu argumentirano dokazao njihovo hrvatsko podrijetlo. To osobito vrijedi za Franza Josepha Haydna, sina Mathiasa Haden-a i Ane Marije Haidin kako piše na nadgrobnom spomeniku koji danas stoji na groblju u Rohrauu. U svoje vrijeme - uz iznimku engleskoga muzikologa W. H. Hadowa (1859.-1937.) - posebice u njemačkim zemljama dočekana "na nož" a danas posvema odbačena, Kuhačeva pretpostavka ostaje ako ništa drugo a ono curiosum sui generis. See also sheet music taken from Austrian - American Magazine, March 2002. For more details see Hadow's analysis from his monograph A Croatian Composer; notes towards biography of Joseph Haydn (London 1897). ...if we accept the historical statement as true, we do something to rescue a musical nation from undeserved neglect. The race which has given to a master not only birth but inspiration may surely claim from us someting better than oblivion into which we have allowed its name to fall. Subsection titles given by Darko Zubrinic. Hadow's original text goes in continuo. Acknowledgment: I express my deepest gratitude to Adam Eterovic, USA, for having sent me a copy of Hadow's book, and also to Frank Kurt Cylke, National Library Service for the Blind and Physically Handicapped, The Library of Congress, Washington, USA, for the missing page 48. On this web since February 1999. Larousse Musique in 1957 considers the Slavic - Croatian roots of Haydn possible. Hayden included in his music about 30 Croatian folk melodies! EXCERPTS from the book from p. 13 to p. 40.
p. 13 ...But it is wholly false to infer that music is independent of nationality. The composer bears the mark of his race not less surely than the poet or the painter, and there is no music with true blood in its veins and true passion in its heart that has not drawn inspiration from the breast of the mother country. p. 15 ...The subject of the present essay is one of the most remarkable instances of such misattribution. From the time of Carpani to that of Dr. Nohl, Haydn's biographers have been unanimous in describing him as a German, born, as everybody knows, in Lower Austria, speaking German as his native language, Teutonic in race, in character, in surroundings. Yet the more we study him the more impossible it becomes to regard his music as the work of a Teuton. p. 16 ...Haydn's sentiment is of a kind without analogue among German Composers - mobile, nervous, sensitive, a little shallow may be, but as pure and transparent as a mountain stream. His humour is a quality in which he stands almost alone. 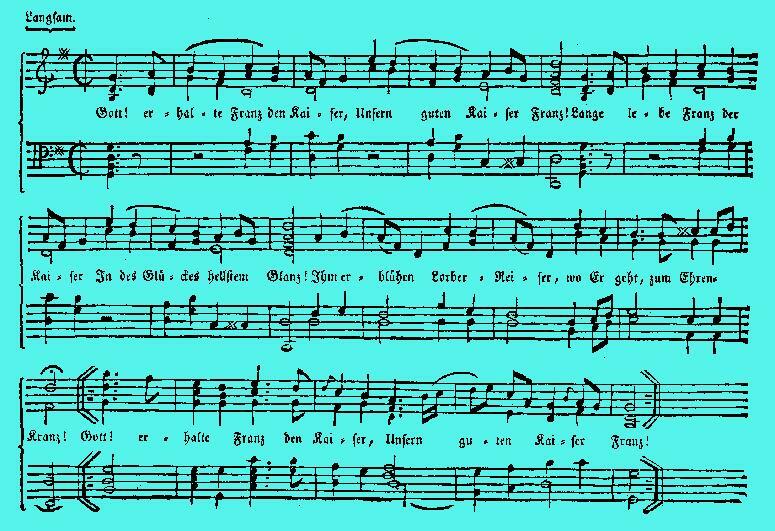 p. 16 ...The shapes of his melodic phrases are not those of the German folksong; his rythms are far more numerous and varied; his metres are often strange and unfamiliar. p. 17 ...In a word, his range of stanza is far wider than that known to the Germany of his day, and many of his most characteristic tunes belong to another language and another scheme of versification. The evidence here briefly epitomised can only point to one of two conclusions: either that the law of nationality is inapplicable to Haydn, or that his assignment to the German race is an ethnological error. The former alternative is unsatisfactory enough; the latter was for many years put out of court by our inability to sustaint the onus probandi. But in 1878 Dr. Kuhac began to publish his great collection of South - Slavonic melodies^* [Juzno-slovjenske Narodne Popieveke: Zagreb 1878-1881.] and in 1880 he supplemented it by a special pamphlet on Haydn's relation to them.^* [Josip Haydn in Hrvatske Narodne Popievke: reprinted from the Vienac, Zagreb, 1880.] 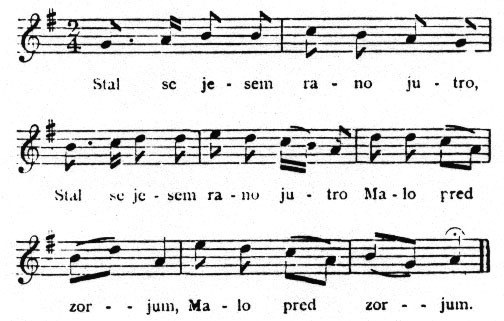 The main points of the thesis are three in number: first, that the Croatian folk-tunes possess all the characteristics which have been noted as distinctive in the melodies of Haydn; second, that many of them are actually employed by him; and third, that the facts of his birth and parentage afford strong presumptive proof that he was a Croatian by race. p. 19 ...First, then, we must consider whether the character of the Croatian people is such as to render its claim to Haydn reasonable and intelligible. It would be poor logic to illustrate our law by deriving a great artist from an inartistic nation. And the question becomes more pressing when we remember that Haydn's whole family was musical, that he learned his first lessons from his father and mother, that his brother Michael long enjoyed a repute little inferior to his own. But to answer it in the affirmative is to run counter to an established belief. p. 20 ...To dispel this superstition it is only needful that we should study the country. Few towns are more charming than Agram [=Zagreb], few regions more delightful than the long fertile valley of the Save in which it lies. ...And throughout the country love of music prevails.^* [Dr. Kuhac (Josip Haydn, p.5) declares that one in every three of the population "either sings, plays, or composes." And there is a significant Croatian proverb to the effect that "an age is known by its music."] The men sing at their plough, the girls sing as they fill water-pots at the fountain; by every village inn you may hear the jingle of the tambura, and watch the dancers footing it on the green. Grant that the music is not always of a high order, that the tunes are often primitive and the voices rude and uncouth, still the impetus is there, and it only needs guidance an direction. Certainly the present condition of the race does not disqualify it to be the parent of a great composer. p. 25 ...Meantime, while the fortunes of Croatia were at their lowest, an event of earlier occurrence was producing important consequences. The Southern Slavs had always been a migratory people. As early as 595 they occupied the Tyrolean Pusterthal, where they have left their mark, not only in the character of the inhabitants but in a large number of local names; later, under stress of Turkish invasion, they colonized Montenegro; and in the fifteenth or sixteenth century a body of Eastern Croats - Bosnen or Wasser-Kroaten, as the Germans called them - settled in the district of Central Austria which extends from Lake Balaton north-west to the Danube. The new home was eminently suited to the development of the race. It was rich and fertile, with vine-clad hills and broad stretches of alluvial plain, it was well wooded and well watered, it extended to Pressburg [Bratislava], the second city in the empire, and contained at least one other town of considerable note; it was within easy reach of the great intellectual and artistic movements. There is littel wonder that this region soon came to be regarded as the focus of Croatian life, and that the wealth which sought it for entertainment attracted in due course the talent which sought it for livelihood. p. 26 The number of the original immigrants is unknown, but by the eighteenth century they unquestionably formed the larger part of the population. In 1780 Pressburg contained rather less than 28,000 inhabitants, of whom about half are noted in the official census as Croats or Slavonians; while the smaller towns and villages in the neighbourhood were mainly occupied by the newcomers, and are still, despite German and Magyar influence, largely affected by Slavonic traditions. It is something more than a coincidence that among all district of Austria this area of Croatian settlement has been the most fruitful in great musicians. Veit Bach, the grandfather of John Sebastian, was born at Pressburg; so was Chopin's great hero, Johann Nepomuk Hummel. The Haydns came from a neighbouring village, the proper name of which - Trstnik - was despairingly translated by the Germans into Rohrau... Liszt was born at Rustnik, near Oedenburg... Ludwig Strauss at Pressburg,... And round this constellation there gathers a whole nebula of lesser stars, names unfamiliar, it may be, to English readers, but in their own country accepted and recognised. Of course it is not claimed that all these artists are of Croatian blood. Some unquestionably are not; but there is at least an a priori likelihood that some of them belonged to the race which was numerically dominant, especially as that race was Slavonic and therefore musical, and on this general point a word may perhaps be said before we proceed to particularise in the case of Haydn. p. 31 ...We cannot, then, assert that there is any antecedent improbability in assigning Haydn to the Croats. They are a musical people, they formed the chief population of the district where he was born, they have a fair claim to other great musicians of his time. It follows that we should discuss the biographical evidence, and see what is to be made out of the record of Haydn's family. And here attention should be called to three points. First, that the name Hajden or Hajdin (with its derivative Hajdenic, Hajdinovic, &tc.) is of common occurence throughout Croatia, and, in days when spelling was roughly phonetic, may easily have appeared in Austrian official documents as Haiden or Hayden, forms by which its pronunciation is exactly represented. Now among all the variants assumed by the name of the composer's family,^* [Dr. Pohl gives fourteen variants, and even his list is not exhaustive. There are at least six in documents relating to the composer himself. See Appendix G.] these two are the most frequent and the most authoritative. His great-grandfather - the first member of the house who can be traced - appears in the Hainburg register as Caspar Haiden; his grandfather, once by obvious error called Thomas Hyrn, is usually Hayden elsewhere, the contemporary monuments at Rohrau give Mathias Haiden as the name of his father and Josephus Hayden as his own. p. 33 ...Secondly, the name, in one or other of its variants, is widely spread over the whole district from Wiener-Neustadt to Oedenburg. Dr. Pohl found it in some ten or a dozen villages, many of which are claimed by Dr. Kuhac as Croatian, and in the country towns like Hainburg or Eisenstadt it is of course more frequent still. There is no need to remind the reader that this is precisely the region occupied, since the sixteenth century, by the Slavonic immigrants. Thirdly, the home of the entire Haydn family is situated at the centre of the district in question. p. 36 ...His talk, like his music, was full of that obivious fun which raises a lough by a sudden touch of the unexpected; so are hundreds of Croatian ballads and aphorisms... But good, bad, or indifferent, it marks a distinctive type of peasant character; and in remembering that Haydn was a genius we need not forget that he was a peasant. The same holds good, too, of his religious feeling. It is not without significance that we may turn from one of his scores, with its "In Nomine Domini" at the beginning, and its "Laus Deo" at the end, to read in our newspaper that another Croatian village has risen in revolt upont the bare report of an ecclesiastical change. His temper, it may be, had grown more equable than that of his uneducated countrymen; it had not lost anything of their loyalty. p. 37 ...And probability will strengthen to certitude if we realise that Haydn's music is saturated with Croatian melody, that the resemblances are beyond question, beyond attribution of coincidence, beyond any explanation but that of natural growth. Some of his tunes are folksong in their simplest form, some are folksongs altered and improved, the vast majority are original, but display the same general characteristics. He would stand wholly outside the practise of the great composers if he wrote, by habitual preference, in an idiom that was not his own. EXCERPTS from the book from p. 40 to p. 65.
p. 40 ...It will be remembered that for thirty years, from 1761 to 1790, he worked as Prince Esterhazy's Kapellmeister in the very centre of the Croatian colony. He must have heard these songs every day, he must have set his life to their lilt and cadence; they were the melodies of his own people, the echoes of his own thought. No one is surprised that Burns should have gathered the Ayrshire peasant songs and transmuted them into gold by the fire of his genius; it is not more wonderful that Haydn should have enriched the treasures of Eisenstadt with metal from his native mines, and as Heine pertinently puts it, the Temple is built by the Architect, not by the stonecutters who supply him with his materials. Among the numerous illustrations collected by Dr. Kuhac, the following deserve special attention. EXCERPTS from the book from p. 65 to p. 72. 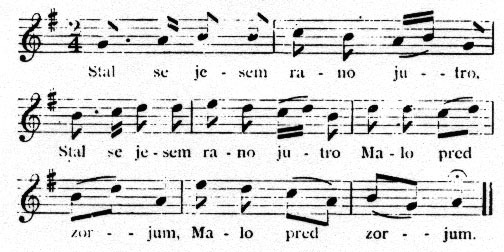 In these versions the last four bars appear to have been loosely attached to the rest of tune; at any rate, they are often found, apart from the first phrase, in Croatian carols and drinking songs. The rest is easily divined. When in 1797 Haydn was commissioned to set the National Anthem, he must have had this tune before his eye, and have determined to use it as the pedestal of the Monumentum aere perennius which his loyalty erected. And here a word may be said as to the manner in which the great tune appears to have been written. It was no momentary inspiration, no sudden impromptu that should come into existence at full growth; like most of Beethoven's music, it was made carefully, and by deliberate weighing of alternatives. By a piece of singular good fortune, we are for once admitted to the master's workshop, and allowed to take our lesson in melody by the observation of his practice. following it with repeat-marks, after the common method of primary form. Two other changes explain themselves. The measure is dignified by the broader time-signature, and the accent shifted from arsis to thesis by the rearrangement of the bars. Otherwise, in the first half of the stanza the folk-tune remains unaltered. EXCERPTS from the book from p. 72 to p. 98. [p. 72] It is to be hoped that these examples will not encourage any reader to pursue Haydn with the cry of plagiarist. No accusation could be more unfounded or more unreasonable. He poached upon no man's preserve, he robbed no brother-artist, he simply ennobled those peasant-tunes with the thought and expression of which he was most nearly in accord. The whole extent of his indebtedness is at most an occasional melody, and is often but a single phrase; the treatment, the setting, the workmanship belong as truly to him as Faust to Goethe, or Cymbeline to Shakespeare. The master who has written a hundred and twenty first-rate symphonies, and eighty-three first-rate quartets, may surely claim the right to take his wealth where he finds it; and if we are churlish enough to deny this, at least we may allow him the privilege of speaking in his native tongue. ...It is more important to note how closely his special melodic gift is in sympathy with that of his people. Many of the tunes quoted above are among those which a critic would select as especially characteristic: there are literally hundreds of his inventions by which, in a more or less degree, the same qualities are exhibited. No doubt he was not only the child of his own nation, he had his own personality, his own imaginative force, his own message to deliver in the ears of the world. But through all these the national element runs as a determining thread. That "les grands artistes n'ont pas de patrie" is a sentence abundantly refuted by its very author; it assuredly finds no support in the life of the Croatian peasant who has made immortal the melodies of his race. p. 83 ...Nothing can be more false than to regard him as merely a Court musician, writing with ready and facile talent the pičces d'occasion that were needed for the theatre or the reception-room. His life at Eisenstadt gave him opportunity such that no composer had ever before enjoyed, but the patronage was too enlightened and the character too strong to be satisfied with work that was mannered or artificial. Under the famous "livery of blue and silver" there beat the heart of a rustic poet, full of kindliness, of drollery, of good-fellowship, of the love for children and animals. His genius, trained by years of assiduous labor, gave him a complete mastery over the inherited resources of his art, his imagination extended them with fresh discoveries and invention. But throughout the whole his favorite themes are pastoral, songs of the shepherd and the harvester, songs of country courtship, songs of the vintage feast and the jovial holiday. It is little wonder that he should speak in the language of his people, or recall the phrases that had been familiar from his childhood. p.84 ...He could not have written of set habit in the German idiom; he was Slav by race and Slav by temper, and his music is too genuine to present itself in foreign guise. It is from this point of view that we should understand him; not by loosely classifying him among a people with whom he had little in common, but by regarding him as the true embodiment of his own national spirit. Note - For similar examples in other parts of Austria, see Kämmel's "Die Anfänge deutschen Lebens in Oesterreich." Maiersdorf, Zverndorf, Pangort, Marchegg, Bratisey, Senfeld, Hlohovac, Siebenbrunn, Horisey, Stradorf, Poturno, Limisdorf, Andlesdorf (Razvitnjak), Gustatin, Petronel, Rohrau (Trstnik), Wildungsmauer, Kaglor, Piselsdorf, Mannersdorf, Au (Cindrov), Hof (Cimov), Landeck, Kroatisch Wagram (Ogran hrvatski), Frama, Fuchspichl (Fukspil), Ort, Bratstatin, Lower Siebensbrunn, Kroatisch Haslern (Hazlor hrvatski). Besides the whole district round Eisenstadt, Oedenburg, and the Neusiedler See. Musicians born in Pressburg [Bratislava] and its Neighbourhood. Hans Neusiedler, Lutenist, born 1563 near Neusiedler See. Viet Bach, grandfather of J.S. Bach, born about 1580 at Pressburg. Andreas Ruach, organist and composer, born about 1590 at Pottendorf. Samuel Bockshorn (Capricornus), conductor, born in 1629 at Pressburg. Joseph Haydn, born in 1732 at Rohrau. Michael Hadyn, born in 1737 at Rohrau. Johann Evangelist Haydn, born in 1743 at Rohrau. Matthias Kamiensky (Kamenar), composer, born in 1734 at Oedenburg. Theodor Lotz, musical instrument maker, born about 1740 at Pressburg. Anton Zimmermann, composer, born in 1750 at Pressburg. Jacob Hurtl, oboe-player in the Esterhazy orchestra, born about 1760 at Eisenstadt. Joseph Weigel (Weigl), composer, born in 1706 at Eisenstadt. Ivan Bihari, violinist and composer, born in 1769 at Great Abony. Stephan Koch, musical instrument maker, born in 1772 at Vesprim. Ivan Fuss, composer, born in 1777 at Tolnau. Johann Nepomuk Hummel, born in 1778 at Pressburg. Joseph Blahak, composer, born in 1779 at Raggersdorf. Ivan Fuchs, Kapellmeister to Prince Esterhazy, born in 1780 at Eisenstadt. Peter Lichtenthal, composer, born in 1780 at Pressburg. Count Thadeus Amadé, pianist, born in 1783 at Pressburg. Adolf Müller, composer, born in 1802 at Tolnau. Joseph Wurda, singer, born in 1807 at Gjur (Raab). Friedrich Fischer, singer, born in 1809 at Pressburg. Franz Liszt, Born in 1811 at Raiding (Rudnik). The case of Liszt is somewhat apart from the others. The earlist form of his name appears to be Listhius, which Dr. Kuhac claims with some plausibility as Slavonic (nase gore list). But as early as 1747 the Magyarised form appears in the person of Canon Johann Liszt; and there can be little doubt that by the time of the great pianist's birth the family had become thoroughly Hungarian. There are, of course, many Hungarian families in which Magyar and Slavonic strains are united, and in the music of Liszt the Magyar element unquestionably predominates. Michael Hauser, violinist, born in 1822 at Pressburg. Joseph Joachim, born in 1831 at Kitsee. Carl Goldmark, born in 1832 at Keszthelyn. Ludwing Straus, born in 1845 at Pressburg. Leopold Auer, violinist, born in 1845 at Vesprim. Charlotte Debner, violinist, born in 1846 at Kitsee. (a) Translated (equivalent of meaning: conjectural). (b) Corrupted (Adaptation of sound: reasonably certain). Register of Caspar Heiden's marriage, Hainburg, 1657. Register of Joseph Haiden's death, Hainburg, April 19, 1715. Register of his mother's death, Rohrau, February 25, 1754. Register of Thomas Hayden's death, Hainburg, September 4, 1701, and of his widow's re-marriage, Hainburg, January 8, 1702. Register of the composer's marriage, (St. Stephen's, Vienna, November 26, 1760). Register of Mathias Hayden's death, Rohrau, September 14, 1763, and the monument to him now in Rohrau Churchyard. Frequent concert notices, both of the composer and his brother Michael, the latter at Salzburg. Habitual signature for many years of Michael Hayden. The composer's monument in Count Harrach's Park at Rohrau. The name of composer's mother is so given on the monument in Rohrau Churchyard. The composer's name is so written throughout the "Convention und Verhaltungs-Norma" under which he held his appointment at Eisenstadt. Register of Thomas Heiden's baptism, Hainburg, 1655. Occasionally, though rarely, in concert programmes. Register of Mathias Haydn's baptism, Hainburg, January 31, 1609. The composer's habitual signature after February, 1762. Register of his wife's death, Baden, March 20, 1800. Diploma of the Freedom of Vienna, April 1, 1804. Many notices and concert programmes. Monumnet to the composer in the Einsiedeln Church at Eisenstadt. Register of Barbara Haidn's baptism, Hainburg, January 2, 1658. Frequent notices and concert programmes. Register of Thomas Hayrn's marriage, Hainburg, November 23, 1687 - his father's name is also given as Caspar Hayrn; see items (1), (2), and (3). Register of Mathias Hein's marriage, Rohrau, November 24, 1728. Occasional variants in registers and documents at Heinburg, Rohrau, etc, noted by Dr. Pohl (also below).